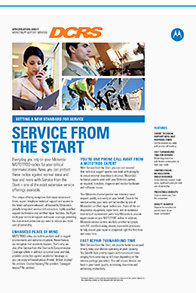 Service & Maintenance of MOTOTRBO Two Way Radios, Systems and Applications. We are committed to delivering outstanding levels of customer service to support you through the lifecycle of your product. Based at our Head Quarters in Cambridgeshire, our well-equipped, modern service centre homes our in-house repair and installation department which is run by Motorola Solutions MOTOTRBO manufacturer-trained and certified engineers. The best way of ensuring your MOTOTRBO Two Way Radios, Systems and Applications equipment is running safely, efficiently and with minimal breakdowns is to ensure it is serviced and maintained on a regular basis. Whether your MOTOTRBO radios or onsite system(s) have been purchased from us, or not we can repair and maintain almost any type of radio communication equipment used in the UK today. All of our processes conform with our rigorous quality standards accredited to IS09001: 2008 and environmental management policies. For a quick & efficient turn around we offer a reactive repair/service. Utilising only original Motorola Solutions MOTOTRBO manufacturer parts, equipment is repaired / serviced by manufacturer trained technicians. We offer a full client reporting system to ensure 100% traceability and reportable history. A multi-year programme that offers you a choice of packages to protect your radio, further information is detailed below. Find out more about the packages here. These contracts extend beyond the initial build and installation phases and focus on on-going general maintenance of your radio system. With bespoke benefits and system specific plans and costs to ensure your radios and/ system are always performing 100%. You can include but are not limited to: Annual inspections, guaranteed on site response times, fast track service, unlimited repairs and guaranteed parts availability and free collection and delivery service. We can adjust software and features and re-programme your units remotely, on site, or via our service centre ensuring your equipment is always complying to the manufacturers specification. Our fully qualified engineers can carry out pre-installation and problem finding coverage tests to assure your system is installed correctly the first time and increase efficiency & coverage footprints. We can offer a multitude of platforms to allow your two way radio system to be incorporated into your existing on site processes such as: Alarms, BMS, doors / gates, telephones. See more information on our applications page. On-site, or remote technical support service maximises your system’s uptime. It validates and optimises your IP network and site connectivity of your MOTOTRBO radio system during integration.